As in the U.S., mergers in the U.K. and the E.U. are subject to review by regulatory authorities. The proposed deal to combine Sainsbury with Asda, a subsidiary of Walmart, Inc., will be reviewed by the U.K. Competition and Markets Authority (CMA). The merger announced in 2018 would create a supermarket giant with a 31 percent share of the grocery market and employ 330,000. This would place the consortium above current market leader Tesco with a 27.8 percent share and Morrison's with 10.6 percent. Deep discounters Aldi and Lidl with a combined share of 12.8 percent would be pivotal to the CMA evaluation of whether the Sainsbury-Asda merger would be detrimental to consumers. Currently there are 463 local areas in the U.K. where Sainsbury and Asda stores overlap. This might suggest higher prices with elimination of competition if stores were closed post-merger. Sainsbury promised in the proposal to the CMA to reduce retail prices by 10 percent across the board. There is concern that even if the reduction were to be achieved, the anticipated lower retail prices would be effectively supported by small suppliers. 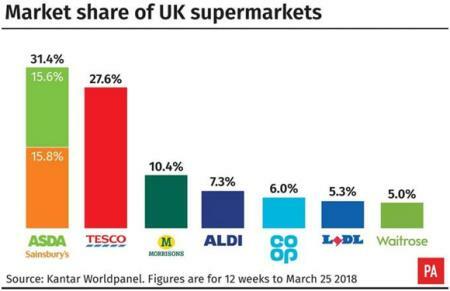 This is based on the fact that the combination of Sainsbury and Asda would have less buying power over companies such as Proctor and Gamble and Coca Cola than relatively smaller manufacturers and packers. If the CMA demand divestment of many stores, the deal may become non-viable. Disposal of large supermarkets would be difficult given the current U.K. economic climate and the move towards smaller local stores. This trend has favored the rise of Aldi and Lidl offering a limited range, house brands and significantly lower prices than conventional supermarkets. Walmart is naturally eager to relinquish control of Asda and become a minority shareholder in a hopefully more profitable business. If the CMA axes the deal, Walmart will have to go back to square one and seek another merger partner or devise a strategy appropriate to the highly competitive U.K. market.